Mary Ann Gebhardt has been studying yoga for over 30 years. She is a registered member of the Yoga Alliance E-500 hour and a Chopra Certified Instructor. Mary Ann weaves elements of the Chopra Center teachings of The Seven Spiritual Laws of Yoga into her practice. Mary Ann is an Ayurvedic Lifestyle Educator in Perfect Health a signature mind-body wellness program at the Chopra Center. 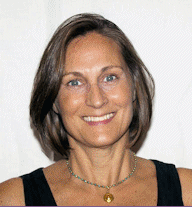 She is one of the Lead Educators of the American Yoga Academy. Her teaching is a weave of the five elements in nature, Ayurvedic principles, meditation and yoga. Studying Ayurveda at the Chopra Center she found the missing element to her yoga practice. Mary Ann became fascinated by the power of food as medicine, and is presently studying Energetic Nutrition with the Ayurveda Polarity Therapy and Yoga Institute. Her love for yoga and ayurveda inspired her to travel to Nepal, where she trekked the Annapura Circuit. Mary Ann encourages students to move with respect and honor, to awaken their unlimited creative nature. As Reiki Master, Mary Ann creates a deep relaxation at the end of each yoga class. Her deep respect for yoga comes in part from her experience working as a Medical Technologist in Hematology and Open Heart Surgery at Hackensack Medical Center. There she witnessed the powerful connection between the mind and body in the healing process. Yoga Alliance. 200 hours in 2001 and E-500 hours in 2008. The American Yoga Academy. 300 hour Yoga Teacher Training in 2001. Reiki Master – The Usui System of Natural Healing in 2001. Yoga for two Pre-natal Yoga – The Barnes Method in 2002. Training covering Yoga for Pregnancy 1, Yoga for Pregnancy 2 and Postpartum/Mommy and Baby Yoga. Thai Yoga Healing with Jonas Wesring in 2002. Ayurveda Yoga Institute. Ayurveda Yoga Intensive with Sarah Tomlinson in 2003. Yoga Sutra for Life. 500 hours Level 2 Yoga Instructor Program with Ranjitha Sandeep in 2008. Chopra Center Certified Instructor with Deepak Chopra, David Simon, Clair Diab in 2009. Seven Spiritual laws of Yoga Instructor. CPR Heartsaver AED Certification. Currently up to date.